Rositha Chen is the legislative affairs analyst in the BGA office in Taiwan. In this role, she provides analysis and suggestions to clients about the political environment of Taiwan. Rositha has more than 20 years experience, having worked with Taiwan’s legislature since 1994. With her expertise, she can assist with and resolve differences and disputes with the legislative and administrative branches of government for local and international corporations working in different sectors. Over the years, Rositha has established a strong relationship with high ranking officers with all political parties and the media in Taiwan. Since 1999, she has worked with Taiwan’s copyright legislation and was involved in lobbying the legislature to pass Taiwan’s bill for intellectual property protection. Besides a long history of working with the International Federation of the Phonographic Industry, Rositha also assisted the Motion Picture Association of America establish a Copyright foundation office in Taiwan. After this, she began to work with multinational corporations, including HP and Phillips, on environmental and patent issues. Beginning in 2010, Rositha frequently traveled from Taiwan to Shanghai, China, working with multinational corporations to solve political and economic conflicts. 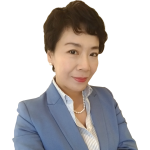 In 2012, she was recruited by China’s largest pharmaceutical company, Yunnan Baiyao, as Taiwan’s legal and public relations consultant and served as an officer in the company for nearly five years. During this period, Rositha created a new channel for food, pharmaceutical and biotechnology products to be brought to Taiwan. She also learned about cultural differences between Taiwan and the Chinese mainland. Rositha majored in mass media in college, but because of her early involvement in the establishment of new political parties, she has remained deeply involved in this field.